*Prices applicable to Singaporeans, Malaysians, Singapore/Malaysia Permanent Residents, Singapore/Malaysia Employment Pass Holders. **Prices applicable to all other nationalities. ^Include 1N stay at Tawau. Flight Transfers, Equipment Rental and Marine Park fees are not included in the above prices and shall be paid for upon arrival. Equipment rental is generally MYR95 per day for a full set of equipment, depending on availability. Sipadan National Park fees are approximately RM40 per day. PADI diving courses, and alcoholic beverages can be paid for at the resort. Guided Sunset (mandarin fish mating) and guided night dives are available upon request if you have 50 logged dives with at least one night dive. *NOTE: You will have to wait at Tawau Airport for the transfer if your flight arrives to Tawau less than 1 hour before the next flight. Boat departures from Semporna to Resort are at 09:30, 13:00 and 16:30 hrs. Diving on arrival day is only possible if you arrive to the resort on 09:30 hrs boat schedule. Please be ready at Seafest hotel’s lobby at least 30 minutes before the scheduled boat departure if you transfer to Semporna overland from Kota Kinabalu, Sandakan or Lahad Datu. 1 Night Dive S$22.50 per diver per dive with minimum 3 divers. Rates are subject to changes. Contact Dive Asia Now to actual rate. PADI Open Water Referral S$425.00 for 4 Open Water Referral Dives over 2 days of diving. Rates are subject to changes. Contact Dive Asia Now to actual rate. PADI Open Water Course S$625.00 for Theory Session, Confined Pool Session, 5 Open Water Dives with Certification. Rates are subject to changes. Contact Dive Asia Now to actual rate. PADI Advanced Open Water Course S$470.00 for 5 Advanced Open Water Dives with Certification. Rates are subject to changes. Contact Dive Asia Now to actual rate. 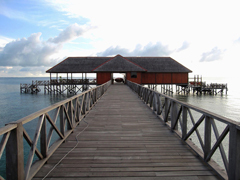 Located in Pulau Mabul, Borneo Divers Mabul Island Resort is one of the most ideal inland resorts for divers. Specially built and and customized for avid divers wanting to explore Sipadan Island. Personalized service is one of the main selling points of the resort. Besides the personalized service and customized facilities for divers, the probability of diving at Sipadan when staying at Borneo Divers Mabul Resort is relatively higher due to its smaller capacity. If you wish to get more dives at Sipadan, Borneo Divers Mabul Resort will be the best choice. On top of the usual diving spots at Sipadan, Mabul and Kapalai, Mabul Borneo Divers also offer divers other exotic diving sites such as Si Amil Island and Mantabuan Island. These sites are known for muck diving, ideal places for macro lovers. Being the first resort built on Sipadan Island and subsequently moved to Mabul Island in order to protect the marine environment, Borneo Divers have one of the most experienced crew to company you on your diving trip. If you are lucky, the crew can even bring you to some of the untouched dive spots around! Pulau Mabul is located 15 minutes from Pulau Sipadan and about an hour from Semporna by boat ride. Three meals are served in buffet style at the main dining hall daily. The types of food served comprises Chinese, Malay and International cusines, however, do note that pork is not served in this place. 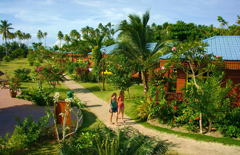 Learn more about Borneo Divers Mabul Resort . Learn more about Borneo Divers Mabul Resort PADI Open Water Diver Course.